The third largest populated state borders the Atlantic Ocean and the Great Lakes of Erie and Ontario. It was the western part of New York had been settled by the six nations of the Iroquois Indians centuries before the Europeans arrived. The Lenape tribe occupied the southern end of the region. There were Spanish explorers are early as 1524 to the area and then the French explorer, de Champlain in 1608. The Dutch came to the area first to trade with the Indians and then by 1613, the earliest Dutch settlement was built which consisted of a number of small huts. By 1624, New Netherland was a province of the Dutch republic. Many of the settlers of the Dutch settlements were not Dutch, but rather Walloons (Belgium French and German) and French Huguenots coming for religious freedom. Mixed in were Africans who were enslaved laborers. Later many Scandinavians arrived, so the diversity of individuals increased. New Amsterdam at the port entrance of the Hudson River that became a major hub for trade between North America, the Caribbean and Europe, and the place where raw materials such as pelts, lumber, and tobacco would be loaded. During the period of 1673 to 1674, the English captured, lost and then recaptured New Amsterdam, so establishing the Province of York. The city of New Amsterdam became New York. Tensions arose between the original Dutch settlers of the Mohawk and Hudson valleys as the English expanded along the eastern side of the region and along the Hudson River. In 1710, some 2,800 German Palestine emigrates were established by the English in the central New York area to be a buffer between the English settlements and the French and Iroquois Indians further west. The New York colony continued to improve as a trading and business area, along with good agricultural production. In 1776, it also rebelled against the British rule and fought for independence. Yet, many of the residents, called Loyalists, did openly also support the British. With the British capturing New York City, it served as their military and political base of operations in North America for the duration of the conflict. On July 26, 1788, New York became the 11th state in the union on July 26, 1788. It was New York City which served as the federal capital until 1790. A new transportation method that of the Erie Canal was started in New York in 1817. It would be 1825 before it was completed. It method of water transportation overland opened new commerce across New York and to the Great Lakes region. New settlers poured from New England, Eastern New York and Europe into the central and western part of the state. Others went on to Ohio and Michigan. The Erie Canal was the first serious route for settlement west of the Appalachian Mountains. Upstate New York, the leader in the transportation revolution, also became part of the agricultural revolution, the industrial revolution, and even the urban revolution. Turnpikes, canals, and railroads connected eastern cities with western markets were very important in New York‘s development and while examining New York genealogy. The new systems and work opportunities allowed all types of people from very diverse ethnic backgrounds; especially Germans, Scots-Irish and Irish to immigrate to New York. New York was a Union supporter and sent many soldiers to fight during the American Civil War. During this time was the first opportunity many of New York’s newly arrived European immigrants saw other parts of the United States. The strongest symbol of immigration and especially for New York genealogy was the port of New York City. Long before Ellis Island in 1892, immigrants first came to New York. It is estimated some 8 million immigrants came through Castle Garden Immigration Center prior to Ellis Island. Not all remained in the New York region, but rather spread across the country. The Ellis Island Immigration Center opened in January 1892 and over the decades had some 12 million immigrates came through the Ellis. A peak year was 1907 when some 1,004,756 people were processed at Ellis Island. It was closed in 1954. Many immigrants did make New York their home. In 1800 the state’s population was 589,000 residents. By 1830 there was nearly 1.4 million people living in New York. The growth in population reached the 7.2 million mark in 1900 and then 12.5 million in 1930. 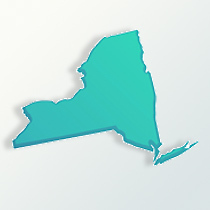 The state of New York in 2009 had about 19.5 million residents with 92 percent of the population living in urban areas. A major influx of African-Americans have come into New York, especially in the New York City area, from other states, mostly for the strong economic opportunities. Approximately 15.8 percent of the state’s population are African-Americans. The next largest ethnic group are Italians, representing 14.4 percent. Those with Irish ancestry are 12 percent and German at 11 percent of the total population. The Latin American cultural groups with the highest numbers are Puerto Rican, Dominican and Jamaican. In the Queens County are people from Peru, Bolivia and Colombia. Also, in Queens are many from Asian nations, as well as the Chinese in Chinatown located in Manhattan. Among the religious groups, those of the Roman Catholic faith represent 40 percent and Protestant religions are 30 percent. The great diversity of ethnic cultures and faiths in New York City and other sections of the state is tremendous.